Pellet fuel is a biomass bio energy product that is a clean-burning and cost stable home heating alternative currently used throughout North America. Pellet fuel is a way to divert millions of tons of waste to energy instead of landfills. Waste products are often turned into pellet heating fuels, with wood pellets being the most common type. Wood pellets are made from compacted sawdust or other waste products of the sawmill. Pellets can include palm kernel shells, coconut shells, rice husk, wheat, and grasses. There are a variety of grades for heating electric power plants, schools, homes, etc. Pellets are very dense and can be made with a low moisture content (below 10%) that means a very high combustion efficiency. As pellet manufacturers refine waste products into uniform pellets, it is important to control the moisture level. The raw biomass has a moisture level of 20-60% while the pellets are substantially lower, around 4-8% water. 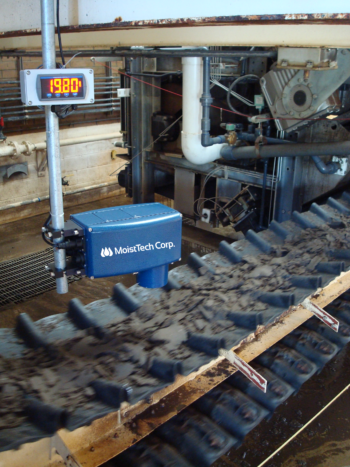 Accurate measurements of the waste to energy pellet moisture changes need to be taken during the process. With the help of industry partners, MoistTech has developed the IR-3000 moisture sensor and transmitter. Its near infrared online sensor gives instant, non-contact measurements in the harshest of environments. Unsurpassed in performance, stability, reliability, maintainability and cost of ownership, the IR-3000 is the answer to controlling moisture in your product. Simply mount the IR-3000 several inches above the conveyor belt. This allows continuous moisture monitoring throughout the pellet process. The IR-3000 is unique in that it gives accurate results even with small gaps in pellet flow. The sensor is calibrated at the factory and requires no further maintenance calibration. For more information contact us. Our friendly, highly-trained staff would love to answer your questions. Feel free to request a quote for your application in moisture control.